Billfish belong to the fish family known as Istiophorids, which are common world-wide in tropical and subtropical waters. Noted for the elongated, spear-like structure on their upper snout, members of this family represent some of the largest bony fishes - some species exceed 1,800 pounds. These fishes are recognized by anglers throughout the world as premier game fish, noted for their high speed runs and aerial acrobatics when hooked. Four species, blue marlin, Makaira nigricans, white marlin, Tetrapturus albidus, sailfish, Istiophorus platypterus, and longbill spearfish, Tetrapturus pfluegeri, occur off our coast. Swordfish, Xiphias gladius, belong to a different family of fishes and is not included as a member of the billfishes, despite its superficial similarities. Billfish prefer the clear, warm cobalt-blue waters of the outer continental shelf and Gulf Stream off South Carolina. However, juvenile and small sailfish and spearfish will stray into nearshore waters, occasionally entering sounds in late summer. Billfish inhabit waters off our coast every month of the year, but April through September is generally considered the best fishing period. Highly migratory, billfish range from their wintering grounds in the Caribbean and the northern South American coast to the east coast of the United States, occasionally moving as far north as New York. A blue marlin tagged off Charleston was recovered 243 days later in the South Atlantic, 600 miles east of Brazil, providing the first documentation of transequatorial crossing by an Atlantic billfish. White marlin tagged off the Carolinas have been recovered from Ocean City, Maryland, to Cuba and Venezuela. Transatlantic crossings also have been documented for marlin. Recoveries of tagged sailfish indicate these fish to be more coastal in nature than marlin. Sailfish tagged off our coast reside in given areas for up to a month, and have been caught off south Florida in the winter. Billfishes are oceanic spawners, releasing their free-floating eggs in summer into the warm, stable environment of the Gulf Stream and Caribbean waters. Females release eggs in the presence of multiple males who release milt (sperm) to fertilize the eggs. Like most fishes, billfish provide no parental care to their young. Blue marlin breed in the eastern Caribbean, white marlin in the northern Caribbean to Bermuda, and sailfish from the Florida Straits into the northern Caribbean. Billfish are among the ocean's top predators. Blue marlin feed heavily on bullet mackerel, dolphin and tuna. While preferring fish of 1 to 2 pounds, they will also eat larger fish. A 33-pound yellowfin tuna was taken from the stomach of a 400-pound blue marlin caught off South Carolina, and marlin regularly consume dolphin in the 10- to 15-pound range. White marlin prefer prey 4 to 12 inches in length. Their diet consists largely of squid, small tunas, dolphin and flying fish. Sailfish also prefer smaller prey, feeding heavily on bullet mackerel, sardines, squid, dolphin and flying fish. Most smaller prey are simply overtaken and swallowed whole, although the spear (bill) is used extensively in feeding on larger prey. Sailfish have been observed darting through schools of bait, slashing the spear from side to side, stunning as many fish as possible and then returning to pick up injured and dead fish. Marlin have been observed spearing fish, then dislodging them by shaking their head from side to side. It is common to find holes the diameter of the marlin's bill in larger fish taken from their stomachs. The blue marlin is the largest member of the family, and the second most common off our coast. Recreational anglers catch an average of 70 to 80 fish off our shore annually. Blue marlin avoid waters below 68 degrees, preferring temperatures of 75 to 78 degrees. In early spring, they are restricted to the warm Gulf Stream waters beyond the continental shelf, but as the waters warm in summer, they may move into waters as shallow as 20 fathoms (120 feet). Blue marlin grow fast, obtaining a size of 65 to 100 pounds in the first year, and females reach 1,800 pounds. Although males seldom reach 300 pounds, they may live to 30 years or more. Female blue marlin reach sexual maturity at approximately 350 pounds, males at 125 pounds. Historically, blue marlin off our coast average 250 pounds. The current state record is 752 pounds caught in 1993. White marlin move from their wintering grounds off the South American coast near Guiana and Colombia through the Straits of Florida to their summering grounds from Cape Hatteras to Cape Cod. The most common marlin caught off North Carolina, white marlin are the least common of the three species taken by South Carolina anglers because their migration route lies more than 150 miles off our coast. Anglers catch an average of 24 white marlin annually. Although most white marlin caught off our coast weigh an average of 45 pounds, a state record of 108 pounds was caught in 1981. White marlin prefer waters of more than 50 fathoms (300 feet). Although age, growth and reproductive biology of these fish are still unknown, tag recoveries show that they live at least 8 years and obtain sizes of 20 and 30 pounds in their first and second years. Unlike blue marlin which tend to be solitary, white marlin regularly travel in small schools. Sailfish are the most frequently caught billfish off our coast with 80 to 100 fish taken annually. They average 35 pounds with the current state record being 75 pounds. Sailfish peak in abundance off our coast in July and August and are commonly caught in waters of 15 to 50 fathoms (90 to 300 feet). In late summer young fish enter nearshore waters and occasionally venture into bays and sound. Sailfish are fast growing and may reach 72 inches in their first year, 85 inches their second year and 92 inches by the end of the third year. Most sailfish caught off South Carolina are less than three years of age. Like white marlin, these fish travel in small schools. The longbill spearfish is the least common of all Atlantic billfishes. Fewer than a dozen of these small, unique billfish have been documented as caught off our coast in part because fishermen frequently misidentify spearfish as sailfish. Little is known about the life history of these fish. They reportedly average 20 to 25 pounds with the current state record being 53 pounds. When pursuing billfishes, attention to detail is critical. A 400-pound blue marlin will test not only the stamina and skill of an angler, but also the quality of the equipment. One flaw in the system and the fish wins. When a novice fisherman sees his first 400 pound marlin jump 10 feet in the air or strip 500 yards of 80-pound line under a 25- pound drag in a matter of seconds, he is left with a permanent respect for the grace and sheer power of these fish. Encounters between billfish and fishermen are evenly split as to the victorious party. Billfishing is not just angler against fish, but rather a four man team against a very worthy opponent. One person must constantly keep the boat in the right position. Another person has to grab the 15-foot leader and physically pull the fish the final distance to the boat, while the final person first keeps the angler who is sitting in a specially designed chair facing the fish he is fighting, and then when the fish is leadered to the boat, tags or gaffs the fish. Trolling is the primary method used to catch billfish off our coast and normally is carried out 30 to 75 miles offshore. Blue water trolling is more complex than similar methods employed in inshore or freshwater fishing. Typically, 80- to 130- pound test line and tackle is used when fishing in 50 fathoms or more where blue marlin are commonly encountered. Most anglers use 30- to 50- pound class tackle when fishing the shallower waters where sailfish dominate. Boats generally fish from 5 to 9 lines at one time in a very precise pattern. Lures 6 to 8 inches long, whole dead fish 10 to 14 inches long and small lures, combined with whole fish, are used to catch sailfish and white marlin. Larger baits, lures up to 18 inches, whole fish up to 4 pounds and 8- to 10- inch lures combined with whole 12- to 16- inch fish are preferred for blue marlin. These baits are pulled at speeds of 5 to over 10 miles per hour. Such speeds may seem fast until you know that billfish have been clocked swimming at more than 45 miles per hour. While billfish can be smoked to make an outstanding table delight, the meat is considered only fair when served fresh. Billfish are primarily caught as a target species by the recreational fishery and as unintentional bycatch of the domestic and foreign commercial longline fishery. Longlining accounts for more than 85 percent of the billfish caught in the Western North Atlantic. Since the early 1970's there has been serious concern about the decline in billfish populations in the Western North Atlantic. Recognized as an economically important recreational resource to the U.S.'s East and Gulf coasts, billfish came under federal management restrictions in the US Economic Exclusive Zone (3 to 200 miles off the East and Gulf coasts) in 1988. Under these management guidelines, commercial fishing vessels are not allowed to retain any billfish. Minimum size restrictions were placed on fish landed by recreational fishermen in an attempt to insure that 50 percent of the fish caught would be returned to the water. Recreational anglers have led the effort to conserve billfish stocks by seeking increased protection for them. Former governor Carroll A. Campbell's concern for the health of the billfish stocks led him to found the South Carolina Governor's Cup Billfishing Series in 1988. Recognizing the benefits which the series brought to the state and its natural resources, Governor Beasley made it an official program of the Department of Natural Resources in 1995. Operated by the Division of Marine Resources and funded by private donations, the program's goals are to promote coastal tourism and offshore big game fishing along our coast while fostering increased conservation of these and other fishery resources. With an emphasis on education, the Governor's Cup has brought national attention to the need for billfish conservation. The South Carolina billfishery has changed from a 90 percent kill fishery to a 90 percent live-release fishery. Not only do the fishermen release most of their billfish, but very importantly, most take the time to place a scientific tag in these fish to assist fishery managers in obtaining life history information including information on their movements, occurrence, and biology which otherwise would be prohibitively expensive to collect. Fish that produce thrust by use of the tail as a propeller, rather than through eel-like undulations of the entire body, require a rigid skeleton. Billfish possess the ideal skeletal structure among all species of fish. A relatively few large vertebrae (26 in swordfish, 24 in billfish) have replaced the typical and more flexible fish backbone composed of more and smaller vertebrae. Marlin and sailfish vertebrae interlock for even greater strength. The large head, rigid tail stock and powerful muscles add to the body's inflexibility. 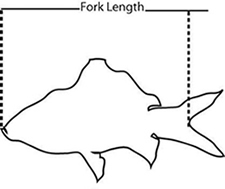 Thus, the "locomotor wave" that drives the fish forward with side-to-side sweeps of the tail has a long length and high frequency for maximum efficiency. The delta-shaped tail of a billfish generates optimal forward thrust without the nagging drag of a solid, triangular tail. Keels on the base of the tail further reduce drag by directing the flow of water to the propelling fin. Most marlin and sailfish also have the ability to flatten their other fins against their bodies when swimming at high speed. Swordfish lack this ability, but their rigid pectoral and pelvic fins produce "cavitation flow" around the fish, which greatly lowers drag. Billfish probably swim with mouths open, funneling a stream of water through their large gills to improve swimming efficiency and to keep the gills supplied with oxygen. A high level of dissolved oxygen in the bloodstream may also give these remarkable fish the ability to achieve quick runs with mouth and gill covers closed for maximum hydrodynamic movement. Well developed jaw muscles allow billfish to open or close their mouths even when subject to the considerable water pressure generatedby high-speed swimming. As a final refinement, these fastest of aquatic animals have scales, deeply imbedded in the skin so as not to impede the flow of water past their speeding forms. Scales are more obvious in juvenile billfish. When swordfish grow to a length of about two feet the animals lose these structures. The scales of other billfish become deeply embedded in the skin as the fish approach adult size. No aspect of billfish morphology has drawn as much attention or speculation as the bill, or rostrum. In marlins and sailfish the premaxillary bones of the upper jaw grow forward to form this projection. In swordfish, the rostrum develops from a combination of the nasal and premaxillary bones into a uniformly tapering profile much broader and flatter than in the other billfish. The swordfish bill extends 35 to 44 percent of the fish's total length, 27 to 30 percent in sailfish, 23 to 27 percent in blue marlin and 25 to 26 percent in white marlin. The billfish's lower jaw also grows forward but to a much lesser extent. Although it might seem that the bill serves as a weapon to subdue and capture prey, much conflicting evidence has been developed on this point. A scuba diver off the African coast once observed a large black marlin run down and impale a thirty-pound amberjack, shake the fish off its bill and swallow it. Other observers have reported similar instances, and freshly caught fish removed from the stomachs of landed billfish occasionally bear puncture wounds or injuries attributed to sideways blows of the bill. However, perfectly healthy billfish have been caught with missing or broken bills. Some scientists now believe that, while the bill has some potential use in the capture of prey, many such incidents result from accidents during quick turns in highspeed pursuits. Certainly the rigidity of the body precludes an ability to chop in the vertical plane although the bill could provide lateral blows. Billfish probably find the rostrum somewhat useful to aid in the capture of large fish, or to slash through a school of bait fish, killing or maiming as many as possible. The bill also serves to reduce water pressure at the mouth of a swimming fish, allowing freer flow of water into its mouth and through it gills. Without a constant supply of oxygen to the bloodstream, billfish could not maintain long runs at top swimming speed. Fish that have lost their bills in accidents may simply learn to forgo attempts to capture larger mackerels and tunas, increasing the percent of squid or slower-swimming fish in their diets. Billfish, especially swordfish, sometimes "attack" boats, floating debris and even whales. Broken rostrums have been found embedded in a variety of such objects, including other billfish. Zane Grey recounted a grueling all-day battle with a huge swordfish that, at nightfall, began to chase flying fish, apparently unaware of the hook in its mouth. The worn-out angler finally cut the fish loose, fearing that in the dark it might ram the boat and sink it. Such attacks, however, probably result from miscalculations during feeding . Many billfish prey species gather around large objects. In a billfish's intense pursuit of food a sudden wrong turn can leave the bill embedded in the object. The fish then breaks it off in its struggles to get free. The structure of the pectoral fins in billfish, especially swordfish, gives them little value as brakes, leaving the fish with no way to stop quickly . This may explain why swordfish sometimes swim full tilt into boats. Because they can exist in greater numbers than many large mammalian predators, billfish probably encounter many of their own kind during their lifetimes, helping ensure genetic diversity. In other words, cold-bloodedness has some distinct advantages over what we usually consider the more "advanced" warmblooded systems of birds and mammals. The largest marine mammals, baleen whales, feed farther down on the food chain - on small fish, shrimp-like krill and even minute copepods - and must develop thick insulating blubber to invade the food-rich seas close to the poles. While billfish certainly cannot be called warmblooded in the sense of whales, researchers have discovered that swordfish possess a "brain heater" that keeps the brain and eyes as much as 50 degrees warmer than the surrounding water. The heater consists of a fatty organ (about 50 times the mass of the tiny brain) through which passes blood warmed by the metabolic action of the jaw muscles. Unlike other billfish, swordfish dive deeply, perhaps to 1,000 feet or more, in search of food. The sudden drop in water temperature experienced by plunging to such depths could interfere with brain and eyes leaving the fish with reduced vision and motor function, both essential for the capture of prey. The heater keeps these organs at a more constant temperature as the fish passes quickly through water layers of varying temperature. Marlin and sailfish have similar but less well-developed brain heaters. Since these species prefer warmer waters and generally feed within a 100 feet of the surface, they perhaps have less need for such a specialized organ. Bluefin tuna, white sharks, mako sharks and several other species of fish have the ability to maintain their body temperature 22 degrees above the surrounding water temperature. Marlin may also have this ability which could account for their great strength and speed. Although most people once considered ocean resources to be unlimited, recent rapid declines in the populations of many commercial and recreational species have demonstrated the opposite. Numerous types of saltwater game fish now are being over harvested and other species will face a similar fate unless all anglers practice wise conservation and adopt an ethical approach to fishing. The challenge of catching, not killing fish, provides anglers with the excitement and the reward of fishing. Undersized fish, or fish over the limit should be released to ensure the future of fish populations. The number of saltwater finfish tagged and released annually in South Carolina has increased significantly in recent years as more and more fishermen take up this practice that provides information on growth and movement of fish as well as conserving resources. Saltwater fishermen can further contribute to conservation by purchasing a Marine Recreational Fisheries Stamp which is required to fish from a private boat or gather shellfish in South Carolina's saltwaters. Funds generated by the sale of stamps must be spent on programs that directly benefit saltwater fish, shellfish and fishermen. This publication was made possible in part with funds from the sale of the South Carolina Marine Recreational Fisheries Stamp. Help ensure outdoor enjoyment for future generations by strictly adhering to all rules, regulations, seasons, catch limits and size limits. The South Carolina Department of Natural Resources publishes an annual Rules and Regulations booklet that lists all saltwater fishing regulations. Have an enjoyable fishing trip by reading these requirements before you fish.